This spot light is a great value. It includes a high-brightness LED lamp and a light controller inside a special thermally conductive aluminum housing. The light controller offers lots of flexibility. For strobe applications, the LEDs will turn on within 20 microseconds. Enable its burst mode to deliver a pulse of super-bright light. Or disable burst mode for continuous operation, or to use with an external PWM controller. You can control the LED intensity using the built-in potentiometer, or via the 0 – 10 VDC intensity input. The light has an auto-reset circuit to protect the LED against damaging over-temperature conditions. Three small LEDs indicate power, strobe trigger, and fault conditions. The housing has an M12 connector for easy installation. A 3 meter cable is included. 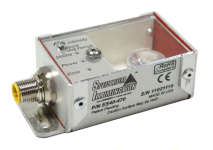 It has conductors for power, NPN and PNP strobe triggers, and analog intensity control. Please contact us if you’re interested in a different diffuser material, a longer cable, or a high-flex cable. Window: Clear Optional diffusers: Clear cover, thin film diffuser, or linear polarizer.